Hey there anyone up for a christmas swap? I was thinking since this is our first swap, and since we have a wide range of doll sizes, we could limit it to props and accessories- or supplies- like fabric. If I do have owners with the same doll maker I could match people but then we would be more likely to guess who we are matched with. I would participate for sure! There might be at least some people willing to make clothes from measurements. I can make simple stuff from measurements. To enter, fill out the following form & PM it to me by November 1st. Can you make items from measurements? What would you enjoy making for someone else? Are you only able to buy items? If you are organizing the swap you can do it whatever way you like of course! Props and fabric would also be really fun. I'd love to participate either way! Oh.. Am I late? If not, let me join to you! How about this for an adapted list of questions? "Can you make items from measurements? 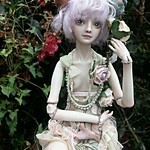 If you don't have a doll, are there props or supplies you might like?" Can you make items from measurements? Yes. The other dolls should be easy to search for measurements by the doll brand name. Or you can submit an anon message to my tumblr (I'm TinyJewelsShop). If you don't have a doll, are there props or supplies you might like? Uh, right now I have this problem of too many supplies/projects and not enough time, so it would be great to recieve a complete thing instead of supplies... But I wouldn't say no to some beautiful lace! And props are always so fun! I have all sizes of dolls so almost any scale will work. Ok last day- please send me your address and answer Allurose's questions- you can post them here- or if your prefer more privacy pm them. Tomorrow is the last day for sign up. I think since we got a late start- though we may try for christmas we might not make it. So how about if we at least get things mailed by christmas? Yeah I'm fine with a ship by Christmas deadline! Whoohoo! Can you make items from measurements? I do not know, have not yet tried to do it. Are you only able to buy items? I love do something with my own hands. I buy mostly souvenirs of my country. Ok I guess its just the five of us.